Melanie asks Christina to be one of her bridesmaids and she accepts. Des comes over and sits with them - Paul is there too. Paul asks if Melanie if she's rushing into marriage and they hope that Roger isn't getting married on the rebound - he's only just divorced his wife after all. Melanie is very defensive and defends Roger, then tells them she's really looking forward to giving up work altogether and becoming a mother. Des awkwardly tells her that this might not be on the cards - when he was chatting to Roger he didn't seem very keen on having more children. Melanie looks a bit shocked, but says she's sure they'll work it out. She looks upset, though. PAUL: You both seem to be looking for different things in this marriage. MELANIE: I want what he wants. CHRISTINA: But that isn't very fair to you. MELANIE: Whatever makes him happy, makes me happy. Caroline comes in and tellss= Melanie that Roger can't make it for lunch, but he'll call in and see her at the office this afternoon. MELANIE:(tersely) I can't wait to get married. No matter what anyone else thinks. Joe is cleaning out some old stuff and Kerry looks through the box, looking for stuff they can re- use - perhaps for her jewellery making. Joe would rather take it to his mates down the tip though. Kerry urges him not to bring more stuff down to the tip that he takes there! Cody is berating Todd for not just telling the teacher that she was the culprit. He says he couldn't dob Cody in. She offers to sign his parental letter so Jim and Beverly won't find out! Roger brings Melanie some flowers and apologises that he couldn't make it for lunch. She thanks him and then starts telling him how negative people are being about their marriage. She asks Roger about having children and he dodges the subject, saying they'll work things out. Melanie hugs him, happily. The school has rung through to Jim to tell him about the fight. 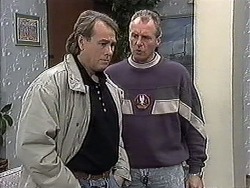 Cody tells Jim that she was the culprit - she was going to flatten Debbie Langford. Todd says it was all a misunderstanding. Jim says Cody leads Todd into a lot of misunderstandings and he'll have to have a word with Doug about it. Christina asks Paul if she can close the gift shop ten minutes early to go to a modelling appointment. Paul agrees, but he and Caroline tell her not to get her hopes up about the modelling too much. Melanie tells them off for being negative again. Jim is telling Doug that Todd can't afford to be in any trouble at all - he's on a good behaviour bond. Doug plays it down saying that it wasn't Cody's fault either, she's just high- spirited. Doug advises Cody not to let Debbie get to her. Jim is appalled with Doug and says that Cody needs punishing. He suggests that Todd and Cody see a bit less of each other. Joe is unloading some stuff from his ute that he got from the tip - a lamp shade and a crib. Joe will do it up in time for the baby. 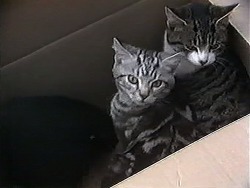 Also, Joe has found some kittens that were dumped at the tip. Kerry says they can keep one, but they'll have to find homes for the others somehow. Tanya (Roger's daughter) comes in to say that Roger is going to me late - her mother's wedding has been called off so he's gone around to support her. TANYA: Pity mum ever got involved with that awful creep or she and Dad would still be together. I'm glad the marriage has been called off, I never did like her boyfriend. MELANIE: How do you think Roger feels about it? TANYA: Pleased, I guess, in a funny sort of way. He was dead against the marriage, he still really cares about mum it was just a pity they couldn't sort things out. 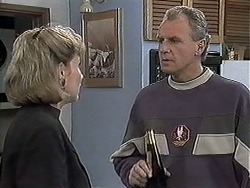 Jim is moaning at Beverly and Helen for not supporting him with Doug, but Beverly reckons Jim was just trying to score points with Doug Willis. When Jim has wandered off, Helen advises Beverly to go easy on Jim, but she doesn't think Beverly has entirely forgiven Jim for some of the things that have happened. Beverly agrees to try to be more supportive. Melanie brings Paul some letters to sign, and then Christina rushes in and tells them that she's got her first modelling job - in a television commerical! They all congratulate her. She's not sure what the commercial is about yet, but she's meeting the director later in the week. In the outer office, Christina invites Melanie for a celebration drink and she agrees to one. In the inner office, Caroline tells Paul that she thinks Christina is hiding something from her. Joe is showing Beverly the crib he got at the tip and she tries to keep her face neutral(!) Kerry asks Beverly to adopt a kitten, but she says she has too much responsibility already. Beverly and Kerry sit down for a chat. She tells Kerry that she feels bad for pulling against Jim today - she thinks she might still be trying to punish him for hurting her when he suggested that the baby might not be his. She's not sure that things will ever be the same between them. Melanie is waiting for Roger and Tanya to arrive, looking sad and apprehensive. She opens the door to them, then asks Tanya to go and play with Jamie. ROGER: What do you want to talk to me about? MELANIE: I believe that the wedding's been called off. ROGER: Yes, she was quite upset. MELANIE: Cried on your shoulder, did she? ROGER: Yes, as a matter...what's wrong with that? MELANIE: It's just that you seem to go running every time she snaps her fingers! ROGER: Well, we're still friends. We were married for a long time, I still care about her. MELANIE: Are you sure it's not still in love with her? ROGER: I wouldn't have asked you to marry me if I was, would I? MELANIE: Wouldn't you? Maybe you wanted to show Miriam that she wasn't the only one who could get married again. ROGER: Don't talk nonsense, Melanie, you know how I feel about you? MELANIE: I know you're very fond of me. But I can't help feeling that you care more for your ex- wife than you do about me! ROGER: If I felt like that about Miriam, we'd still be together, wouldn't we! MELANIE: Tanya told me that she left you. You always gave me the impression that it was the other way round. You cancelled dates with me because you thought Miriam needed you, you're over there at the drop of a hat! ROGER: Look...look, Mel, there's no denying that I still feel strongly for Miriam, but she's about to remarry! MELANIE: *Was* about to remarry. It's all over now, isn't it? MELANIE: How woudl you feel if she wanted to get back together with you? ROGER: I don't think that's very likely. MELANIE: How would you feel? ROGER: Well, I'm not sure, but since it isn't likely, why make an issue of it? MELANIE: Because it's important to me! Perhaps we need to talk about a few things, Roger, like children, you know, do you really want to have more? ROGER: To be honest - no. MELANIE: I've always wanted children. I just assumed I'd be a mother one day. ROGER: We should have talked more about it. ROGER: Perhaps we should postpone the wedding plans for a while to give us a chance to sort out our feelings. MELANIE: To give you a chance see whether you can get back with Miriam? ROGER: I didn't say that. MELANIE: No, but you were thinking it. It's not fair to ask me to marry you when you're still in love with your ex- wife! I think we should just call it off. ROGER: I'm very, very fond of you. MELANIE: I know. And I really love you. But...somehow I can't really see things working out for us. I want a family, you want your ex- wife. It just doesn't seem right. MELANIE: Would you mind going? ROGER: I'll er...cancel the restaurant. Bye. He walks out. Tanya comes out of Jamie's room and hears the last bit. She goes over to Melanie. TANYA: Look, I'm really sorry things didn't work out for you. I know I wasn't happy at the beginning, and I'm really sorry. You're a nice person. They hug and Melanie starts to cry. Tanya leaves, and Melanie starts to sob. 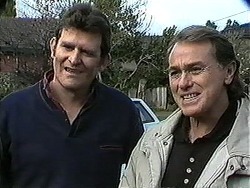 Doug, Des and Cody drive up and tell Jim, Beverly and Todd that they've bought the Willis house! 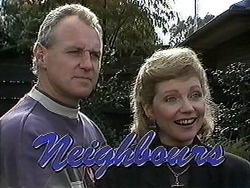 DOUG: I'm your new neighbour! Todd and Cody hug in delight, but Jim doesn't look quite so pleased!